Born July 1, 1927 in Pojuaque, New Mexico to Alfred and Mary Quintana. Passed away February 3, 2019 in San Pablo, CA. His daughter Marlene Quintana, son, Michael (Mary) Quintana; five grandchildren and six great-grandchildren; as well as his beloved, Stella Archuleta, survive him. First wife, Louise in 1987 and his second wife, Jane in 1995, preceded Bennie in death. Bennie left high school, enlisted, and served in the US Navy during World War II. After being honorably discharged, he and his family began their lives in California. Before retiring, Bennie was the Grounds Foreman at Rolling Hills Memorial Park for 28 years. He was an active member of the Eagles, Sportsman’s Club and the San Pablo Senior Center; he had remained active with St. Callistus Catholic Church up until 4 or 5 years ago and was previously a member of the LOOM #550. 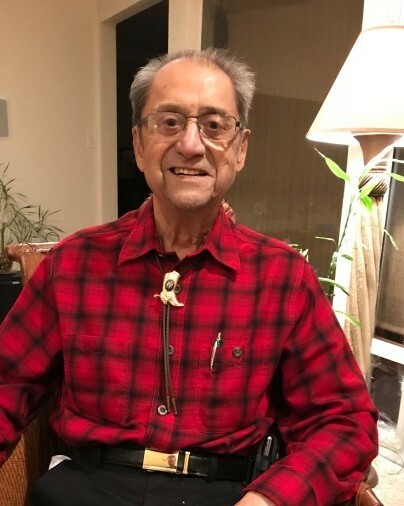 Bennie enjoyed fishing, playing the guitar, as well as Country Western and Ballroom dancing; a love he shared with his daughter, Marlene who has fond memories of learning to dance with her father. Bennie was a loving man, who will be thoughtfully remembered. Though he has left this earthly domain, his legacy will surely live on in the memories and the hearts of those he has gone before. The family of Mr. Bennie Quintana would like to ask that in lieu of flowers, donations may be made to the Kaiser Permanente Oakland Hospice, 4501 Broadway, 1st Floor, Oakland, CA 94611 Or the Charity of your choice.